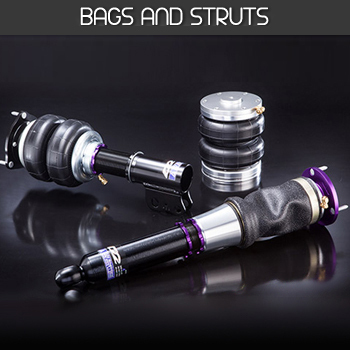 All D2 struts feature threaded bodies, 36 point damping adjustment and dependant on application camber adjustable top mounts, allowing a large amount of adjustment meaning you can tailor the ride to your exact requirements so you can achieve the killer stance you require without a sacrifice in performance! 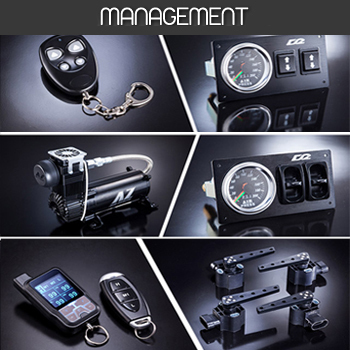 All kits are supplied with all items required to install the kit. All standard kits come with the top of the range Air Zenith OB2 200PSI air compressor and 5 gallon gloss black air tank pre installed on a carpeted MDF board meaning installation is simpler than ever. 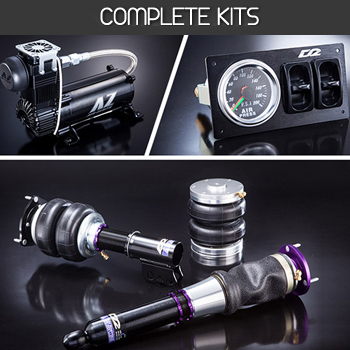 All kits are supplied with fitting / wiring instructions so if you can install a set of coilovers and wire an amplifier you should have no issues fitting, If not don't worry as we have a range of approved fitting centres and retailers nationwide who can cater for your needs. D2 Kits come as standard with 2­way manual paddle valve management with the option to upgrade 4­way or even digital management options. A wide range of fittings and accessories are also available such as port blanks, reducers, push fittings, gauges, tanks, compressors, complete management packages and much much more.